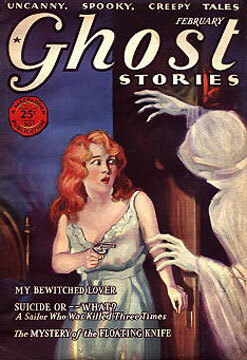 In July 1926, Ghost Stories joined an expanding list of genre-specific titles of pulp magazines. Published by physical-fitness guru and magazine publisher Bernarr MacFadden, it followed in the same vein of MacFadden titles, such as True Stories, True Detective Stories, and later True Strange Stories, featuring "true" confessionals of events. In the case of Ghost Stories, it was encounters with the paranormal and spiritual realms. Many stories featured altered photographs, reinforcing the accuracy of narrative claims. Ghost Stories alternated between "bedsheet" and standard-size formats. It had a revolving door in regards to editors. Many worked on the title during its 64-issue run, and few lasted more than a year. The fiction contributions, however, are worthy of note. The first Agatha Christie story to see print in the U.S. appeared in Ghost Stories ("The Woman Who Stole a Ghost," November 1926). Writers familiar to readers of Weird Tales, such as Frank Belknap Long and Robert E. Howard, also contributed to Ghost Stories; otherworldly tales from decades past were featured as well, including those of Charles Dickens, H.G. Wells, and Arthur Conan Doyle. Brilliantly illustrated covers were provided by several artists over the title's run. 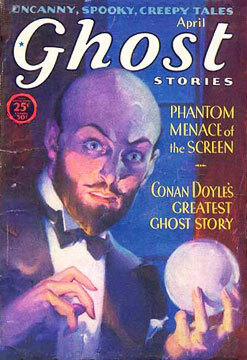 Most notable were illustrators John Drew and Delos Palmer, Jr.
Ghost Stories was purchased by Harold Hersey's Good Story Magazine Co. in 1930, but the former editor of the Thrill Book and the short-lived science-fiction pulp Miracle Science and Fantasy Stories was unable to sustain the title's earlier success. 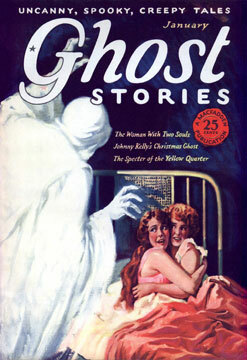 Ghost Stories concluded publication in December of 1931. Hulse, Ed. The Blood ’n’ Thunder Guide to Collecting Pulps. Morris Plains, NJ: Murania Press, 2007. Ashley, Mike, in Marshall B. Tymn and Mike Ashley, ed. Science Fiction, Fantasy and Weird Fiction Magazines. Westport, CT: Greenwood Press, 1985. _____________. The Time Machines – The Story of the Science-Fiction Pulp Magazines from the Beginning to 1950. Liverpool: Liverpool Univ. Press, 2000.